Zombies are now smarter and actually work their way around doors as they chase after you. Also, nearly half the puzzles have been freshly upgraded providing new challenges for fans. The DS's special features are being put to use in the remake as well, as you use the touch pad to solve puzzles and slash at zombies. [The door to another field that is opened when peeping at the notebook, AR horror to experience in the Nintendo 3DS. ※ In this mode, I call ar note = Purple diary, Nintendo 3DS = projection machine. ]. 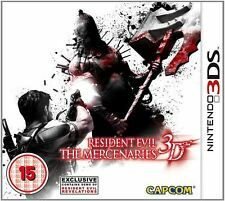 RESIDENT EVIL MERCENARIES 3D This is a BRAND NEW Nintendo 3DS Game Works on 3DS & 2DS consoles only. Not suitable for DS Lite or DSi. Made by: Nintendo. Release Date: 01/07/2011. Scottish Highlands & Islands and Isle of Man. Add to Favourite. Northern Ireland, Channel Isles. This item is complete and in full working order. No real marks to speak of other than the usual light scuffing of the protective plastic film for the box art. Nintendo 3DS: Resident Evil - Revelations [Top Capcom & 1st edition] New & sealed, French version. Développeur Capcom. Région 3DS zoné. Série de jeux vidéo Resident Evil. Code de région PAL. Langue Japonais. Développeur Capcom. Région 3DS zoné. Langue Espagnol. Langue Anglais.